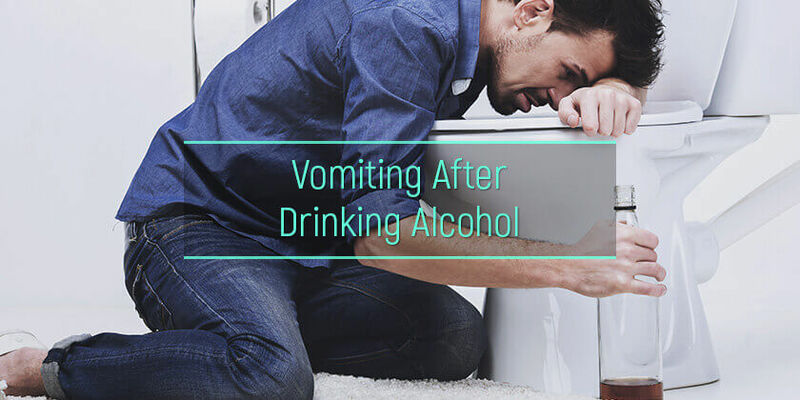 Alcohol vomiting is a common problem experienced after drinking. In the majority of cases, excessive vomiting after drinking alcohol is associated with drinking too much, but this is not always the case. Some people start feeling sick after drinking small amounts of alcohol or when properly pacing their drinks. Sickness can come on directly after drinking or as late as the day after. Because we associate vomiting with consuming adult drinks, this may not seem concerning, but in some cases, it can be. What are the causes of vomiting after alcohol? What are the signs emergency treatment is needed? How to help someone vomiting after alcohol? The reasons why someone might experience vomiting after drinking alcohol are varied. Common reasons include alcohol poisoning, alcohol intolerance, comorbid health issues, and combining substances. It is possible for someone who gets sick after drinking alcohol to be dealing with more than one cause of their sickness. For example, someone who has stomach ulcers might drink to excess, resulting in vomit after drinking alcohol that is severe and dangerous. Here is what drinkers need to understand about reasons why they might be feeling sick after drinking alcohol. Among the most dangerous alcohol effects is alcohol poisoning. When the body realizes that it is experiencing alcohol poisoning, its natural reaction is to attempt to cleanse the body, getting the toxins out so that the person experiencing the condition can survive. It is important to note that vomiting is not always enough for the body to cleanse itself and alcohol poisoning can result in death. Those who have alcohol intolerance do not need to drink to excess to get sick; alcohol intolerance vomiting can begin after a single drink. Some are born with this intolerance, naturally experiencing things like sickness and alcohol allergy rash, while others may develop this with time or due to the use of medication. The vomiting is caused by the immune system attempting to protect the body by expelling the drinks that triggered the allergy. In some cases, a drinker may have other health issues that make the body respond to the presence of adult beverages with sickness. In this case, the answer to “why does alcohol make you vomit?” will depend on what the comorbid health issues are. For example, someone with gastritis might have ulcers in their stomach, and the irritation caused by the presence of liquor may cause reactionary vomiting. Those with the reduced liver function may be unable to filter out the toxins quickly enough, inducing alcohol poisoning even without drinking to excess. Anyone suffering from an illness should research how it can interact with adult beverages before drinking. Finally, if the drinker is mixing adult drinks with other substances, including prescription and illegal drugs, it is possible for vomiting to be triggered. While this is not alcohol poisoning per se, it is an indication that an overdose may be occurring. Anyone who is using prescription medication should research how their medication could interact with liquor, beer, and wine. Those using street drugs should seek rehabilitation treatment. In the majority of cases, alcohol and vomiting indicate minor sickness that can be addressed at home. However, sometimes vomiting after drinking signals a significant problem that requires medical intervention in order to avoid serious complications, including death. Below are signs that a person needs to be taken to the emergency room without delay. It can be tempting to dismiss these signs of a problem. For example, alcoholic vomiting blood may just assume that they went a little too hard that day and promised themselves to do better in the future. However, it is vital that these signs are never ignored. When observing any of these signs, seek emergency medical treatment immediately. For those who are experiencing drinking-induced vomiting or who are wanting to help someone who is, there are some basic steps to take. It is important to keep in mind that these steps are only meant to address the sudden sickness; if the person is addicted and experiencing similar medical events on a regular basis, they need additional help, such as drinking addiction treatment. Discourage them from drinking any more for the rest of the day and night. Some drinkers, especially those with addiction, may want to continue drinking despite it making them sick. If seeing any signs that emergency treatment is needed, contact the local emergency service immediately and get them help. Get them to drink some water or an electrolyte drink. If they have been vomiting, they have lost water, and alcoholic drinks can dehydrate as it is. Think about how to stop vomiting after drinking alcohol. In addition to avoiding drinking until better, think about things like getting away from strong smells and other nausea triggers. Avoid any extreme vomiting after drinking alcohol remedies. There are lots of suggestions found online, but many are dangerous. Focus on rehydrating over anything else. Stay with the person until they are feeling better. It is possible for the situation to get worse, so monitoring them can prevent a tragedy. Avoid eating until the next day. Because the stomach is likely irritated from the drinking, food should be skipped until feeling somewhat better. As for what to eat after vomiting from alcohol, bland foods are best. Keep in mind that vomiting does not always start immediately. Many will start vomiting after drinking alcohol the next day. In this case, it is usually part of a hangover and should be treated as such. At this time, it is possible to check for signs of a larger problem as well. For example, someone experiencing alcohol memory loss may be suffering from a binge drinking disorder and require medical assistance. If the person starts vomiting again after a day or more of not drinking, it might indicate severe physical addiction. This is alcohol withdrawal vomiting. If this is noticed, the person requires medical alcohol detox. After any emergency medical situations are addressed, it is time to start thinking about getting help. Those who vomit from drinking on a regular basis are likely battling addiction. They could be genetically predisposed to it, using it to medicate, such as social anxiety and alcohol, or it might have arisen due to participating in party culture that encourages heavy and frequent drinking. No matter the root of the addiction, treatment is required. Luckily, there are many treatment centers for alcohol addiction in the United States.